This little gem is a great bargain. No brush is more effective, but you need to use it correctly. Most importantly, if your record is dirty, do not contaminate your brush with it. You will harm both. 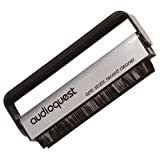 This brush is for new and washed records between plays. First, hold the brush nearly perpendicular to the record surface, with a slightest of bends with the turn. Wipe the tips the long way GENTLY across a cloth. Do this with the record turning on the turntable and do not press. Twice around does the job. This pass removes any relatively large particles and cat hair. Then, point the tips of one row AGAINST the direction of turn at a someshat acute angle, as if you were shaving off a thin slice. This does the deep groove cleaning of dust that records attract. Clean the brush as before. Notice how much is left on the cloth. LP enthusiast "must own" tool! This is a must have for LP enthusiasts. Sure I have a Nitty Gritty cleaning machine and a plethora of other equipment to clean and maintain my records. This little jewel, however, is a necessity for a quick dust off here and there before playing. It cleanly and efficiently wicks dust and small particles out of the precious LP grooves. If you otherwise maintain clean records this will keep that last second dusting from interfering with your listening pleasure. Somewhat smaller than I anticipated it is nevertheless a great size for sweeping the moving LP surface and the bristle guard/handle doubles as a very effective bristle cleaner simply by rotating it forward and back over the microfiber bristles themselves.